Andrés Neuman's thirty-four short stories consider love, lechery, history, mortality, family secrets, therapy, Borges, mysterious underwear, translators, and storytelling itself. Some books demand a slow reading, requiring a period of acclimation. We pick them up in intervals, glimpse their interiors with trepidation. Such is the case with Andrés Neuman’s newly translated The Things We Don’t Do ... There are thirty-four of these experiments, most of them shorter than five pages, all more complicated than they first appear though not necessarily difficult to read. The best of them leave the reader lighter and amused ... Imagine if Lydia Davis, Jorge Luis Borges, and Donald Barthelme spawned a literary child; we might get musings such as these ...stories are grouped into six categories, most are in first person, and most are working out the sort of riddles already mentioned. 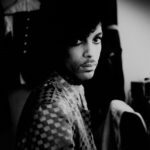 But we also see stories about family legacies, identity, relationships, and loneliness. The tone ranges from silly to serious ...fresh and quirky stories. ...very few authors have the privilege of having a Roberto Bolaño quote on the cover of their work; and at that, one which states, 'Good readers will find something that can be found only in great literature.' You will find this on the covers of Andres Neuman’s works ... 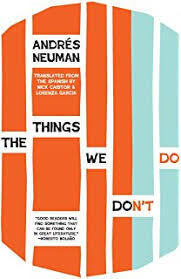 The Things We Don’t Do — Neuman’s latest work in English translation — does not disappoint ... Neuman’s work consists of the combination of the reasons you should read Elena Ferrante and Clarice Lispector with the caveat being that Neuman’s talent is in his ability to capture the voices of all genders, ages, and backgrounds in his works while bringing sparse language to a new level ... divided into four parts, which appear to be based on thematic similarities between the short stories in their respective sections, and ending with a section containing clever aphorisms on writing within the short story form ...quite compelling due to Neuman’s playfulness when it comes to mind games, which are scattered throughout the entire collection. Each story starts from zero, embellishing the suspense of the collection as a whole and causing the reader to finish reading the work in one sitting ...can only come from an author who is aware of his language, his peers, and what came before and what will come after. In the new short story collection The Things We Don't Do, Andrés Neuman takes us across the spectrum, through the quotidian. And in those passing, everyday details that fill our lives, we meet people from nearly every walk of life... And Neuman takes us in and out of these stories and worlds with a casual grace. From crime drama to the equivalent of a romantic comedy, he is able to switch it up while maintaining a self-assurance that the reader can rely on ...but I find myself coming back to this question time and time again: Where does the short story belong? ...I find myself wondering, why is this one book? What are all of these stories crammed into a single volume? What are they doing together? ...this is a marvelous showcase of Neuman's abilities and potential. But please keep in mind: in the end, this is just a sampler. It is enough to spark your curiosity, though will probably coming up short of a fully satisfying reading experience. What did you think of The Things We Don't Do?